Berry Shoals Intermediate School is located a half mile off Highway 290, 2 miles south of Interstate 85 and one mile from State Road 296, in the fastest growing area of District Five. BRSH sits on the northern half of a 128-acre site on Shoals Road, previously named River Ridge Road. Berry Shoals shares athletic fields and some parking areas with Florence Chapel Middle School, resulting in a significant cost savings for the citizens of School District Five. The creeks, fields and woods of the area provide an ideal setting for science investigations and other outdoor activities. A district committee composed of community leaders, parents, teachers and district administrators researched the historical data of the area, gathered suggestions from community people and recommended four names for the new intermediate school to the school board. The District Five Board of Trustees selected the name Berry Shoals in honor of the family who once owned most of the land surrounding the school. The Berry family purchased the property in the 1800's. A pond was dug and a community sprouted around it. The one-room school house that was built is now on exhibit at the SC State museum. Part of the Berry land was the site of the first conservation project in the United States. 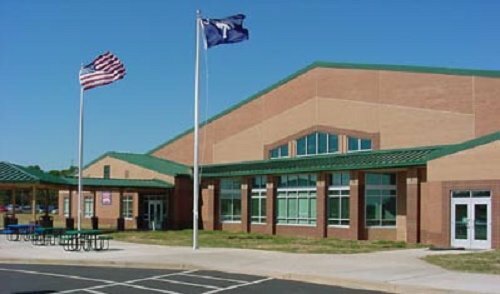 Berry Shoals Intermediate School, which opened in the fall of 2001, serves students in grades five and six in the eastern section of District Five Schools of Spartanburg County. The 120,000 square foot school facility has 36 regular classrooms, 8 special education classrooms, art, music, drama, cafetorium, gymnasium, band and orchestra rooms. The school also features an advanced technological environment within the media center, science and computer labs, broadcast and surveillance systems as well as providing students and teachers with interactive software. Classroom instruction is based on the SC Curriculum Standards. Fifth and Sixth grade students are placed in four-member teaching teams. They attend daily performing arts classes of their choice along with physical education and computer lab classes. The parent organization, PTO, assists with many day and night programs and helps out during the school day. A playground complex is available for students. The Middle Tyger YMCA provides an after-school program for students.